If you’re in a hurry, check out our top pick, EVANPO T95Z PLUS Android TV BOX. TV boxes such as Roku, Fire TV and Western Digital are more popular than ever. What exactly is a TV box? What does it do? Most importantly, why should you buy one? A TV box is a small electronic device that connects to your television, transforming it into a Smart TV. While most TVs these days already use smart technology, a TV box can expand the capabilities of your television, turning it into a less powerful version of your computer, or a larger version of your smartphone. From your TV box, you can download apps, watch local TV channels, connect to streaming apps such as Hulu and Netflix. Depending on where you live, you may even be able to connect to premium cable channels at no extra cost, especially if your TV box uses KODI software. Although many of the TV boxes we will consider in this article are Android TV boxes, we will also be looking at Roku and Fire TV, among others. While all of these TV boxes run via similar technology, they have different operating systems and thus, different user interfaces. For example, Apple TV runs the mobile iOS format, whereas Fire TV runs off Amazon’s operating system, instantly connecting you with Alexa. When it comes to buying an Android TV box, you need to pay close attention to its technical specifications. There are a lot of different factors to consider, and unfortunately, there isn’t an “ideal” TV box that has everything you’re looking for. By familiarizing yourself with some of the more important features in an Android TV box, you can make a smarter purchase for your home and family. Like all advanced electronics, TV boxes run using a dedicated operating system. The OS is much more than aesthetic appeal and a lineup of apps, however. The OS affects the optimization and performance of your TV Box such as memory utilization and OpenGL support. The operating system of your TV box also affects any smart hubs you may have in your home. Since not all smart devices are compatible with one another, make sure your TV box works with the rest of your smart technology. If you use Amazon Alexa, you’ll get the best performance results from a Fire TV. If your home is connected through Apple technology, you’ll need an Apple TV for compatibility. A TV box will be functional no matter which operating system you choose, but make sure you buy one with an up-to-date OS for improved performance. And if you have a smart home, you’ll enjoy greater synergy if your TV box uses the same OS as your smart hub. Audio passthrough is a feature that allows the sound of a video file – such as a Blu-ray that has been ripped to PC to “pass through” the TV box and onto a home theater receiver, which is better able to decode and translate the compressed sound files. In other words, audio passthrough is a feature designed to make your movies, TV shows and even music sound better. While not all TV boxes are equipped with audio passthrough, the feature is frequently found in KODI due to its versatility, and some TV boxes even have 5.1 audio passthrough. This feature isn’t essential for everyone but it’s a good thing to keep an eye for. Dynamic Refresh Rate is another technical term you may or may not be familiar with. Dynamic refresh rate refers to how quickly your TV or computer processes and projects what you’re viewing. 60Hz is considered to be ideal, because at that refresh rate, the human eye can no longer detect blinking, or how fast the computer redraws the images. Unfortunately, not all videos are coded to 60Hz, and when you’re viewing a movie rendered at 30Hz on 60Hz settings, it’s not going to look very good. Dynamic refresh rate switching allows the TV Box to automatically compensate for the difference in frame rate, syncing the lower frame rate of your movie with the higher frame rate of your TV for better visual appeal. For this feature to work, however, you will have to ensure that your software (such as KODI), your hardware (Android, Fire TV, etc.) and your television itself are equipped with dynamic refresh rate switching. If just one of them does not have the feature, you will have to manually adjust the frame rate. For the sake of economy, I’m lumping a variety of important ports together in one category, such as HDMI, Ethernet and USB. While these ports have little in common with one another, they are all very important to your TV box. Easily the most important of these ports is your HDMI port. If you have a 4K TV and want to watch TV at 60FPS, then you’re going to need HDMI 2.0. HDMI 2.0 has a bandwidth of 18GB/second , compared to the 10GB/second bandwidth of HDMI 1.4. While the earlier HDMI model can process 4.0 video, the performance and quality will be better with a more modern HDMI. Also important is a Gigabit ethernet cable. Gigabit Ethernet is the most advanced Ethernet connection, and provides superior data transfer for less buffering during video streams. You also want to look for devices with USB 3.0. Data transfer with USB 3.0 is ten times faster than USB 2.0, so if you’re streaming video files from a flash drive or portable hard drive, you’re going to want USB 3.0. KODI is to your TV box what OpenOffice is to productivity software or what Mozilla is to internet browsers. Just as OpenOffice offers a facsimile of Microsoft’s industry-leading word processing and data analysis software and Mozilla provides a welcome alternative to Chrome, Edge or Safari, KODI is an open-source media center that serves as a hub for all your audio and visual activities, whether it be watching YouTube, streaming music or playing a DVD. Because KODI is open source, it can be installed to almost any TV box. KODI is a comprehensive software program that can function on your phone, tablet, TV or other electronic device, including NAS. In effect, KODI is a media hub that compiles all of your media entertainment into a single, easy-to-use program. And because it’s open source, it can be customized almost endlessly to your preferences. One thing to bear in mind, however, is that KODI does not work nearly as well with Apple devices as it does with other operating systems. While KODI can be installed on your Apple computer, getting the software installed on your iPhone or iPad is a lot trickier. Unless you’re pretty tech-savvy, you’re probably not going to get KODI to work on your iPhone. Our recommendations for the editor’s pick are based on a variety of factors. We take into consideration brand recognition, versatility, technical specifications, performance and overall value. Although it isn’t the most advanced model on the market, we recommend the Evanpo T95Z Android TV Box. It offers excellent hardware and performance but costs significantly less than the most powerful models. No two people are of the same mind about everything. This is as true of shopping preferences as it is of anything else. It’s why one person buys off-brand peanut butter at Dollar Tree and another buys organic peanut butter sold in a glass jar from a health food store. There are times, of course, when being thrifty isn’t worth it. For example, name-brand batteries like Duracell or Energizer will invariably last longer than their bargain counterparts – so much so that buying cheaper batteries will always cost you more in the long run. More often than not, though, you can pay less and still get a good product. In fact, value brands are sometimes a better product than their more expensive counterparts. I always buy generic brown sugar: they taste better and don’t harden as quickly. A TV box is a far cry from cane sugar and molasses, but the principle still applies. You can pay less and still get a good product. 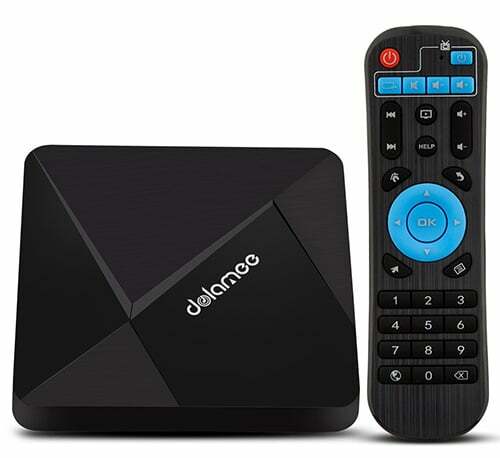 Take the DOLAMEE D5 Android TV Box, for example. It offers nearly all of the features you’d expect from a TV box: 4K resolution, H.265 hardware decoding, a 1.5 GHz quad-core processor, support for 2.4 GHz WiFi and Bluetooth 2.0, 2 GB of memory and 8 GB of storage space. Note that the D5 does not support 3D imaging. You’ll have to pay a little bit more for that. 8 GB of memory is fairly limited, as well, and if you install a lot of apps you might run out of space. In addition, the D5 runs on an older version of the Android OS, which means it may not be compatible with some of the newest apps. KODI does come pre-installed, but it’s an outdated version, so you might want to uninstall it to get access to the latest software. The Dolamee D5 is never going to compete with a Fire Stick or a high-end Android TV box. But if you are new to TV boxes, have a limited budget and aren’t interested in watching 3D movies, this TV box won’t set your wallet back very far. When shopping for a TV box, one of the things you should keep in mind is that most products prioritize certain features over others. A TV box that specializes in video streaming likely will not have the same specifications as a TV box that emphasizes a better gaming experience. Some Android TV boxes aim, not to specialize in one area or another, but to generalize, providing a well-rounded overall experience. These boxes may not be the best of anything, but they’re not going to be the worst either. The Globmall X3 is an example of the jack-of-all-trades Android TV Box. While it may never top the charts, it delivers a solid performance, with up-to-date technology that helps to make it one of the best values on the market. Outfitted with the latest 7.1.2 Android OS, the X3 is ready for 2019. The updated operating system ensures faster performance, improved software compatibility and a greater availability of the latest games and apps. The X3 is ready for 4K video and compatible with 3D technology for an immersive cinema experience. While the 1.5 GHz quad-core CPU is pretty good, the 2GB storage space is severely lacking. You can expand the memory all the way to 32GB with an SD card, but you’re still going to be limited on how many apps you can install, or what video/music files you can store. 2.4 GHz wireless and 10/100 MB LAN are also supported. 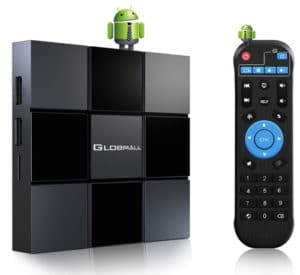 Globmall also comes with an external remote control giving you control over your TV box. It may not be an industry-leading app, but the Globmall X3 offers good video encoding and decent hardware. It’s not going to blow you away, but that doesn’t mean you won’t be impressed by the performance of such an affordable model. In a lot of ways, the GooBang Doo ABOX A1 is quite similar to the Glomball X3. They are similarly priced and have comparable features, but in terms of hardware, the ABOX A1 edges out the X3. One of the most important features to note is the operating system, and the ABOX is loaded with the latest Android OS. Like the X3, the A1 sports native 4K resolution and is outfitted with a 3D graphics accelerator, bringing a new dimension to your television viewing experience. The hardware is pretty impressive for the price, as well. The TV box is powered by a 2.0 GHz quad-core processor, with a penta-core 750 MHz GPU to assist with 3D graphics acceleration. The GPU isn’t particularly powerful, but it does improve the overall performance of the TV box. The A1 also has 2 GB of DDR3 RAM and a 16 GB eMMC storage drive, which can be upgraded with an additional SD card to 32 GB. It is not a perfect product. The remote controller is adequate but not thrilling, and the quality control seems to be quite lax. Defective ABOX models are not uncommon. However, this is alleviated somewhat by excellent customer service and a company eager to address any issues. If you’re looking for a decent Android TV box at a reasonable price, this is a good choice. 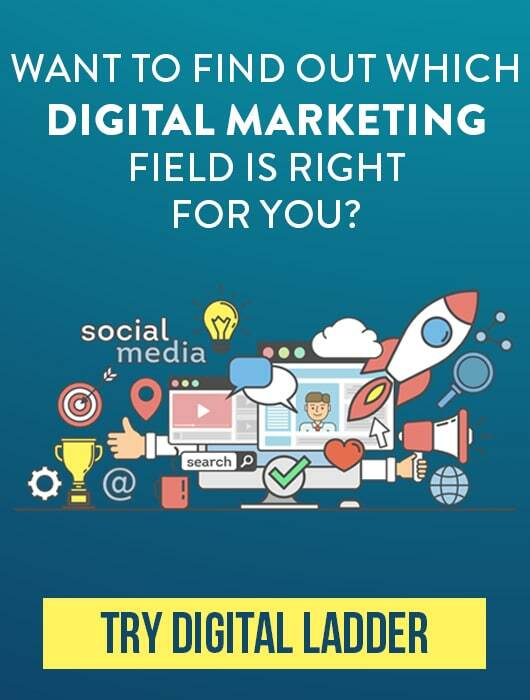 It’s not a home run, but it will get you to home plate eventually. Unlike the last three TV boxes, Fire TV runs off the Amazon Fire OS rather than Android’s Lollipop. Fire TV offers several major improvements over the Fire TV stick, including 4K Ultra HD at 60 FPS, HDR-10 support and a faster processor. There are certain things the Fire TV does very well. It delivers brilliant 4K resolution, and the video quality is noticeably better than less expensive Android TV boxes. It offers pairs beautifully with Amazon Alexa, providing a visual hub that lets you monitor the status of all of your smart home devices. As I mentioned earlier, some boxes excel in certain areas but fall behind in others. Unfortunately, the Fire TV is one of them. The Fire TV has good hardware, with a quad0core 1.5 GHz CPU and 8 GB of storage. Unlike most Android TV boxes, however – or, indeed, earlier models of the Fire TV – the storage space cannot be upgraded past 8 GB. This makes it all too easy to run out of room for more apps. The other problem I have with the Fire TV is that its design seems to be angled towards you buying more products. To get the most out of your Fire TV, you will have to buy an Ethernet adaptor ($14.99) and an HDMI extender ($7.49). Fire TV won’t receive a wireless signal without the Ethernet adaptor, and the included HDMI cable is a measly two feet long. Adding these two products prices the Fire TV at just under $100, which is a considerable mark-up. 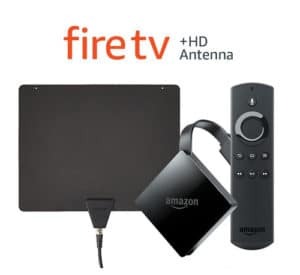 That said, there are still quite a few things to recommend the Fire TV, including its HD antennas, which have a range of up to 35 miles, bringing in more channels for more programming. If you’re running Alexa through your home, Fire TV is definitely the way to go. But if you’re looking for something with customization, there are better options. 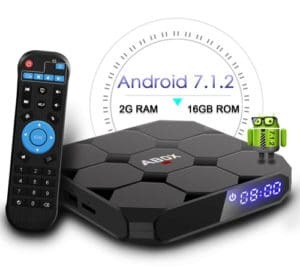 If you’re looking for Android TV box, but want something with better hardware and more capabilities than the Dolamee, Globmall or GooBang boxes listed above, then the Kingbox K3 or the Evanpo T95Z might be more your speed. In terms of hardware, software and performance, the Kingbox blows less expensive Android boxes out of the sky. Kingbox runs the latest Android 7.1 Marshmallow OS just like you’d expect. It also comes with a vanilla version of the latest KODI 17.6 software. KODI comes free of plug-ins so that you’re free to customize it however you please. What’s really impressive about the K3 is its hardware. The TV box is powered by an 8-core Amlogic CPU running at speeds of up to 2.0 GHz. This allows for unparalleled speed and performance, and allows for better multi-tasking as well. The box also has 2 GB of DDR3 RAM and a 16 GB eMMC storage drive. Like other Android boxes, this can be expanded up to 32 GB. The K3 also allows for the latest and fastest in wireless internet technology, supporting both 2.4 and 5.0 GHz wireless connections, as well as a 10/100/1000 Ethernet LAN well ahead of cheaper models. This improved internet speed minimizes buffering and allows for faster downloads and higher resolution streaming. As you might imagine, the Kingbox K3 supports both 4K and 1080p resolutions, as well as H.265 hardware decoding to minimize the pull on bandwidth. The TV box comes with both as remote and a mini keyboard for greater control. 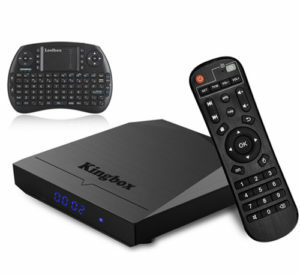 Although the Kingbox doesn’t provide 3D support, it outshines all of the previous TV boxes, both in hardware and performance. There are better models out there, but if you’re looking to maximize performance for the least possible money, this is the way to go. 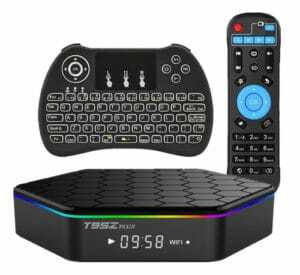 The T95Z Android TV Box is another high-powered piece of technology that competes head-on with the Kingbox K3. Although it’s quite a bit more expensive, it has better hardware in several areas and boasts a sleek, attractive design that is sure to impress. The K3 and the T95Z both use the Amlogic S912 octa-core processor, which works up to four times faster than standard quad-core processors. It also supports both 2.4 and 5.0 GHz WiFi connections, as well as 10/100/1000 MB LAN. Where the T95Z differs from the Kingbox is in its RAM and ROM. The T95Z offers 3 GB of DDR3 RAM, where most others offer just two. It also comes ready with 32 GB of storage, saving you from the hassle and expensive of buying an SD expansion card. The extra RAM dramatically increases the speed and performance of the TV box for a better entertainment experience. It also sports a 3D graphics accelerator, allowing you to bring 3D cinema right into your living room. The T95Z also comes with both a controller and a mini keyboard. The keyboard is backlit so you can see what you’re doing even with the lights turned down, and it’s compatible with PC, Mac, Xbox, other Android devices and a variety of other systems. Thanks to its hardware, the Evanpo T95Z is one of the most advanced TV boxes on the market. While there are other products with better hardware, they come at a premium price, making this one of the best values on the market. The hardware of the Roku Ultra doesn’t begin to compete with those of the Kingbox K3, let alone the Evanpo T95Z. So why is it on this list? It’s simple: ease of use. Unlike most Android TV boxes, which are all made by competing companies, Roku offers a refined, polished viewer experience par excellence. One of the biggest differences between Roku and Android devices is the software. Kodi is one of the most popular pieces of multimedia software, but it’s programming is not supported by Roku. Instead, Roku offers its own bespoke media channel, offering hundreds of movies and shows free of charge. Android TV boxes tend to have problems supporting sports streaming apps. This is another area where Roku excels, working closely with sporting apps to provide a better experience. 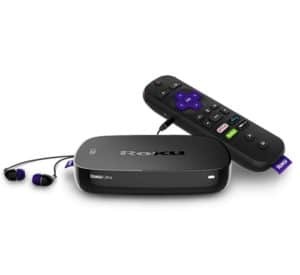 Roku also provides a dedicated mobile app, allowing you to refine and control your streaming and media experiences without using the remote control. As far as hardware goes, Roku isn’t that impressive. It’s quad-core processor works just fine, but at a mere 256 MB, it’s storage space is dangerously finite. It has just 1.5 GB of RAM, which is also substandard. While it supports dual-band WiFi, the Ethernet only goes to 10/100 MB. If you’re looking for a TV box with great hardware, Roku isn’t the way to go. It is almost exclusively intended for video streaming, and doesn’t offer a lot of options for playing games or streaming music. But when it comes to streaming movies, Roku has the market cornered. 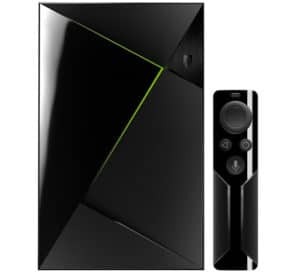 If you’re looking for a way to connect your PC gaming with your Smart TV, the answer is the Nvidia Shield TV Home Media Server. This state-of-the-art TV box uses an advances GPU and its potent wireless connection to cast your PC gaming to the screen of your television without any direct hardware connection, freeing you to play your games your way. The Nvidia Shield comes with formidable hardware. The innovative processor combines two different quad-core CPUs, relegating four cores to simple, low-power tasks and freeing other the other four cores for advanced processes, leaving you with more processing power. 3 GB of RAM offers plenty of speed, and an incredible 500 GB of storage that leaves other TV boxes behind. One of the most exciting features of the Shield Pro is an exclusive lineup of Android games designed exclusively for use with this model. It’s advanced wireless architecture also allows for easy streaming of PC games from the cloud straight to your TV. Immersive audio technology includes full Dolby audio and surround sound pass-through. In addition, the Shield Pro is fully compatible with the Google SmartThings smart hub assistant, connecting your TV box with your smart hub, providing a clear visual interface with all of your smart devices and making it easy to control your home. The Shield Pro is also compatible with a wide range of streaming services, including popular channels, streaming sports stations, PLEX, KODI and more. The Nvidia Shield Pro isn’t cheap. It costs several times more than the average Android TV box, and for a lot of people the extra RAM and powerful GPU won’t be worth the additional cost. But if you’re serious about gaming, the Shield Pro could revolutionize the way you play. Android TV boxes come in almost as many varieties as Android phones, and the abundance of choices can make it hard to separate the wheat from the chaff. Whether you’re looking for a simple budget-friendly model or a powerhouse giant that will revolutionize your home to anything in between, we hope that this guide will help you find what you’re looking for.